The Kongregate Arcade app has returned to the Android Market with a few tweaks that Kongregate hopes will convince Google to allow it to stay. 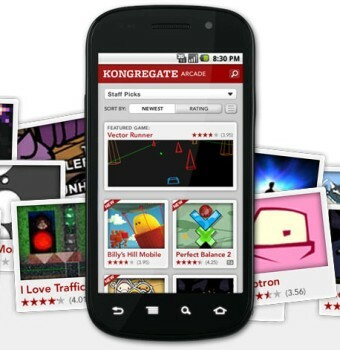 It was a bit of a mystery last week when Google removed the Kongregate Arcade app from the Android Market. The app offered direct access to more than 300 Flash games on Kongregate and although it appeared to be a hit with gamers, its ability to download Flash games for offline play evidently violated Google's rules against apps that distribute other apps. The app remained available for manual installation directly from Kongregate but the site said it was working with Google to get it back on the Market. The Arcade has now been tweaked and resubmitted, and while it still offers access to the Kongregate catalog, all games now run entirely within a browser and are stored within the brower's cache rather than being saved individually on the device. It apparently hasn't been given an official green light by Google, however, meaning it could be removed it again if it's found to be in violation of other terms. In other words, if you want it from the Android Market, you better grab it while you can. Necronomicon Card Game on my HTC. There is a god, and he's hungry!